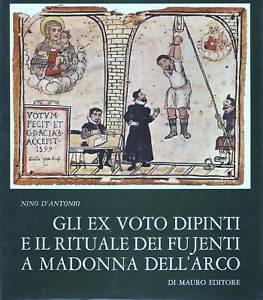 Earlier this week I visited the Catholic sanctuary of the Madonna dell’Arco in Campania on the day of its annual festival, which takes place every Easter Monday (or ‘Lunedi in Albis’). 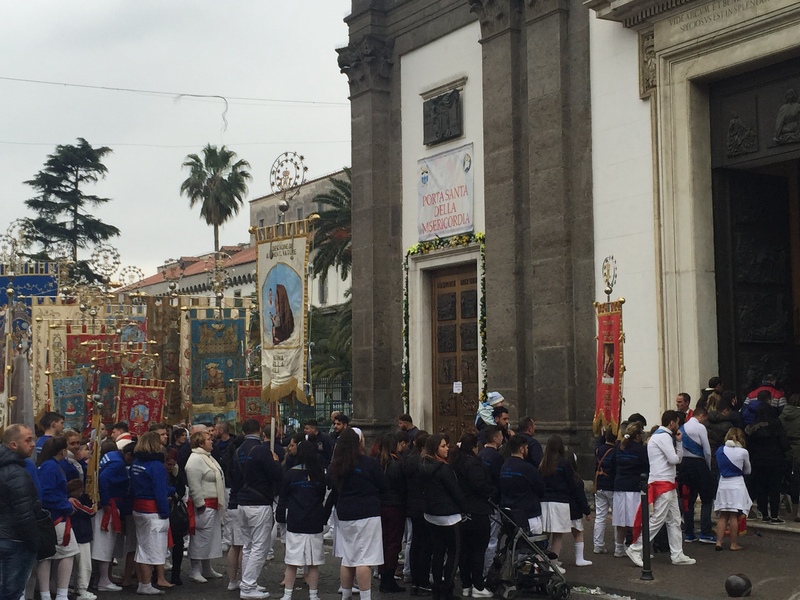 The festival centres around the battenti or fujenti – guilds of devoted pilgrims who walk or run to the church from towns and villages across the region, wearing white outfits with blue and red sashes and often walking in socks or barefoot. I’d been to this sanctuary on other occasions to examine its rich collections of historical ex-votos, including the painted wooden tavolette which depict the ancestors of the modern fujenti. I’m particularly interested in the sanctuary’s colourful foundation stories, and in the connections made between votives and divine vengeance – a theme that I explore in my forthcoming book on anatomical votives from Greco-Roman antiquity. 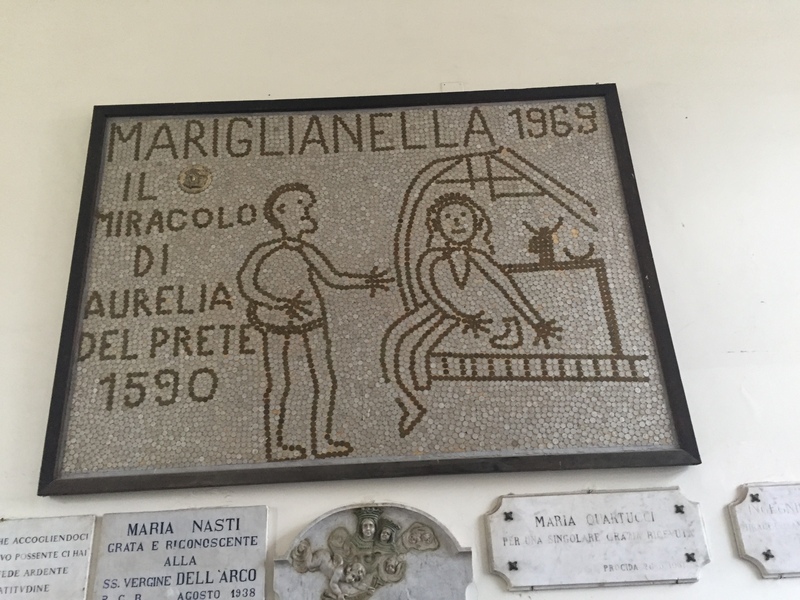 Many of the devotional images at the Madonna dell’Arco sanctuary relate to the story of Aurelia del Prete, who lost her feet on Easter Monday of 1590 after deliberately damaging a wax votive offering exactly one year earlier. Aurelia’s desiccated feet can still be seen in an iron cage in the Sala delle Offerte (Offertory Room), where they present a chilling counter-narrative to the scenes of bodily healing painted onto the wooden tavolette. However, attending the festival gave me some valuable context for understanding the votives I’d seen on previous visits. Despite being just a ‘civilian’ attendee at the proceedings, I was allowed to enter the sanctuary and walk alongside a group of fujenti as they made their way slowly down the nave towards the statue of the Madonna. Outside, the streets had been full of noise and chaos – stalls handing out snacks of cow-feet and cow-heads (O pere e ‘o musso), New Melodic music blaring from PA systems – even a man giving a demonstration of the mops he was selling! But as soon as we passed through the church door, the atmosphere became one of quiet tension and surveillance. Many of the fujenti were shuffling down the aisle on their knees, while others lay fully prone on the floor. Most people were weeping by the time they reached the Madonna, and these tears seemed themselves to be a kind of votive offering (after their special moment with the Madonna had ended, many of the pilgrims rose and wiped their faces with handkerchiefs or tissues, which they then rubbed onto a piece of marble at the back of the altar). More tangible votive gifts included the thousands of large candles and bunches of flowers brought in the procession, and miniature replicas of the embroidered banners that were carried by each group of fujenti. 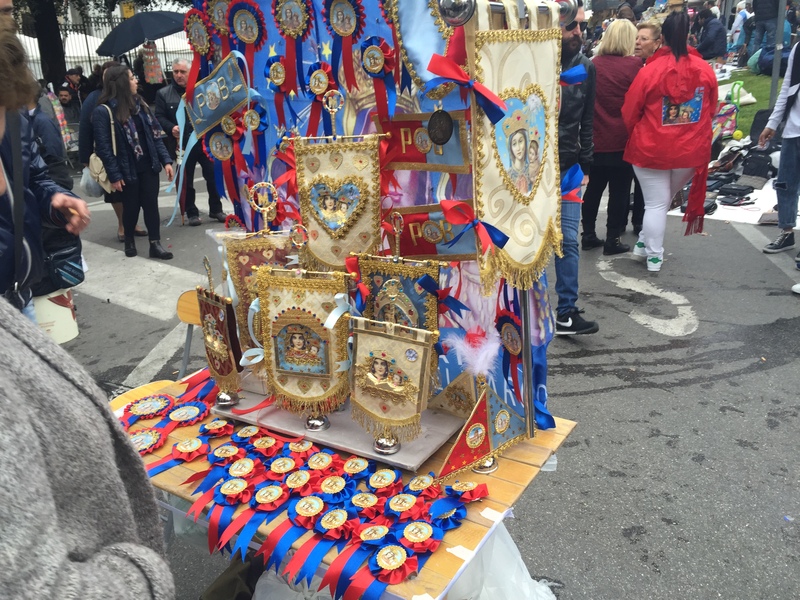 Some of the large processional banners were decorated with money – hundreds of 20 or 50 euro notes arranged in careful rows around an image of the Madonna dell’Arco. Other offerings seemed to be more spontaneous. On the low walls of the sanctuary’s internal courtyard, people were sitting down and washing their feet in plastic washing-up bowls before putting on slippers or sandals; meanwhile, a pile of dirty white socks gradually accumulated inside a disused well in the centre of the courtyard. These socks reminded us that the pilgrimage itself was a voto (and is often described in these terms by participants), whether this term reflects a simple ‘gift’ or ‘act of devotion’, or – as some personal narratives seem to imply – the more technical notion of ‘the fulfillment of a promise or vow made to the Madonna in return for her help and protection’. 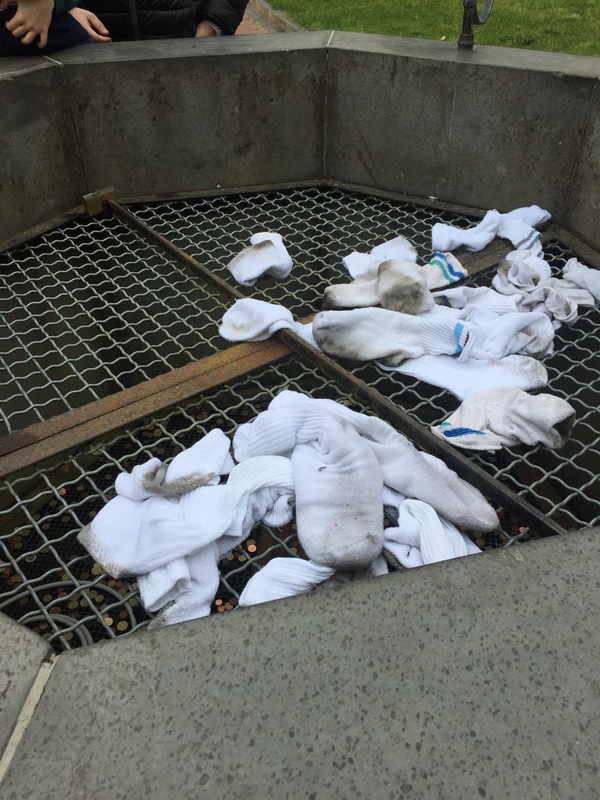 Socks left by pilgrims in a well in the sanctuary’s internal courtyard.